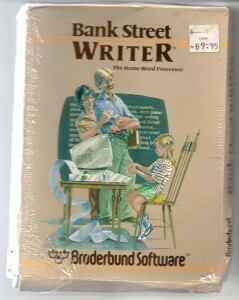 When I was a kid, my parents brought home a word processor for our Apple //e computer called Bank Street Writer. The cover (see right) featured a proud mom and dad watching their little Virginia Woolf pump out pages and pages of fiction on the dot-matrix printer. That image did something to me. I wanted to be that girl so bad. Not because I sought the approval of mom and dad (I mean, I did, but they always gave it automatically), but because I loved the idea of such sheer output. Her fingers were producing work in the form of paper. What alchemy is this!? I bristle hard at the notion of embracing the pretense of artistry without putting in the work. But I am deeply in love with the romantic ideal of the lone wordsmith, pounding out the symbols in a desperate attempt to convey some significant meaning. (It’s not quite the same magic when you’re actually doing it, of course.) I guess, so long as I continue writing, I get to also lust after the iconography of writers. WOO!